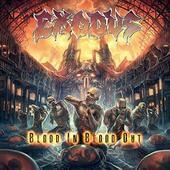 "Blood In, Blood Out" is the tenth disc from the thrash metal band Exodus. This disc has lead singer, Steve "Zetro" Souza, back at the helm. Having skimmed over Exodus in the past few years I found myself excited that they had something new out. It's been four years between projects so we're both ready for the heavy. This disc not only has tons of thrash guitar with great guitar solos, it has plenty of 'additional' musicians including an old hat named Kirk Hammett. Deemed by me "The Locusts of Thrash," these guys come roaring in and leave nothing but bones in their wake. When I need some ripping metal solos that move from speaker to speaker I'll put this disc on. The riffs are catchy, the drums hypnotic. It's what you want and, with sixty-two minutes of music, you'll enjoy your drive home from work. You'll probably cut the time in half if you cue up with this fully-leaded beast first. This album should come with a neck brace so you can still function after it's over. Since the band produced this disc they went with the guts and grit that gives this offering a more punk feel: quicker songs, more blasting in-your-face rhythms and solos that burn. Exodus (plus others): Steve "Zetro" Souza - vocals' Gary Holt - lead and rhythm guitars; Lee Altus - lead and rhythm guitars; Jack Gibson - bass; Tom Hunting - drums, percussion and vocals on the track "Angle of Death". Additional musicians: Dan The Automator - intro on the track "Black 13", Kirk Hammett - guitar solo on the track "Salt the Wound", Chuck Billy - additional vocals on the track "BTK", Anthonly "Rat" Martin - additional vocals on the track "Protect Not Dissect". For more information check out http://exodusattack.com. 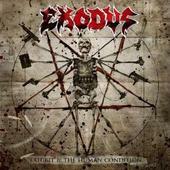 Exodus unleashes a vicious collection of thrash metal driven by anger on the 12-track "Exhibit B: The Human Condition." This underrated veteran Bay Area quintet raise the bar and deliver an intense slab of aggressiveness under the guise of metal guru Andy Sneap with the colossal twin guitar presence of Lee Altius and Gary Holt tenaciously throwing down catchy and crushing streams of razor-sharp riffs and over the top solos (“The Sun is My Destroyer”, “Class Dismissed”). Vocalist Rob Dukes really comes into his own here, reverberating with a harsh and menacing tone that sits squarely between former singer’s Steve Souza and Paul Baloff while the rhythm section pound out a flurry of the blistering and brutal tempos that Exodus helped to spawn nearly 30 years ago (“Burn, Hollywood, Burn”). Chock full of neck-snapping fretwork, jackhammer rhythms, and dizzying thrash metal expedience, the latest affair from Exodus portrays what the epitome of thrash metal excellence sounds like and is a must-listen disc for any self-respecting headbanger. For more information, check out http://www.exodusattack.com. 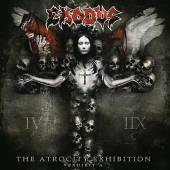 Thrash metal titans Exodus once again produce the goods necessary for a neck-snapping good time on the nine-track "The Atrocity Exhibition: Exhibit A." Pulverizing drums, acerbic yet acrobatic twin guitars, and a genuinely pissed-off vocal delivery are some of the highlights this disc showcases, firmly setting this unsung Bay Area unit's return in concrete. Tracks like "Funeral Hymn" bowl the listener over with a barrage of furious six-string grooves backed up with sledgehammer rhythms while cuts like "Children of a Worthless God" find the band barely recognizable of its 80s metallic self while ripping it up with an unsurpassed intensity. Exodus surprisingly takes its sound into the future with dark-shaded brutality and an overall menacing malaise, hardly reminiscent of the band that gave you anthems like "Toxic Waltz" or "Low Rider" yet perfect for today's metal climate. 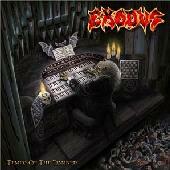 Exodus mark their return from a lengthy absence with "Tempo Of The Damned," a decent return to the metal arena. This album is very similar to the band's "Fabulous Disaster" production-wise. The mix is solid and the record sounds great when you turn the volume up loud. Exodus have slowed a bit in comparison to previous releases; however, every track bears the unmistakable Exodus sound and the music is still powerful, heavy and strong. Many riffs on the album sound as if they were written with more of a hard rock vein in mind, but they are nonetheless infectious and fitful. Don't worry, Exodus fans, there's still plenty of thrash here to go around (circle pit, anyone?). Vocalist Steve "Zetro" Souza is a poignant lyricist using humorous plays on words and catchy passages that will have you singing along by the end of each song. My personal favorite track is "Throwing Down." On this song the vocals sound much less forced and I favor this style of singing as opposed to Zetro's trademark wail. "Culling The Herd" is a bit slower and features a memorable chorus line, while "Scar Spangled Banner" is an up tempo anthem which will no doubt incite uncontrollable moshing in a live setting. The guitar attack of Gary Holt on this track is frantic and vigorous. On "War Is My Shepard," the vocals are a bit varied with Zetro venturing into deathy territory on the chorus. With phrases like "Praise the Lord and pass the ammunition," the lyrics to this tune focus on a topic that rests on many people's minds today - War. "Blacklist" has a nice crunchy feel and another war-themed song, "Forward March," chugs along at a good rate while Souza chants the words in a military manner. These guys are masters at creating catchy riffs that make you want to get up and move, but this being said, I would have expected a little more speed and power from a new Exodus release. If you're a previous fan of the band that wasn't offended when they drifted from their more aggressive "Bonded By Blood" style, you will surely find this interesting. However, I don't feel that there's anything that breaks new ground here. Recommended for collectors and fans of straight up mid tempo thrash only.